DDR2 is the next-generation evolution of DDR memory technology. DDR2 memory features faster speeds, higher data bandwidths, lower power consumption and enhanced thermal performance. DDR2 memory chips will be available in Fine-pitch BGA (FBGA) chip packages for improved electrical and thermal characteristics. In addition, DDR2 memory chips will incorporate On-Die Termination (ODT) to minimize memory signal reflections at high speeds, thereby improving timing margins. DDR2 memory chips will come in capacities up to 4 Gigabits, allowing for higher-capacity modules. The Module is DDR2-667 CL5 ECC Unbuffered Memory module. 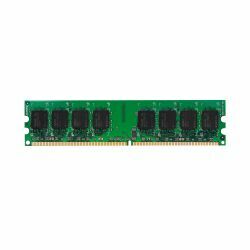 The Module density from 512MB to 2GB, it consists 64/128MX8 bit DDR2-667 Synchronous DRAMs in FBGA packages, Memory Module intented for mounting into 240-pin edge connector sockets. • Serial presence detect with EEPROM.